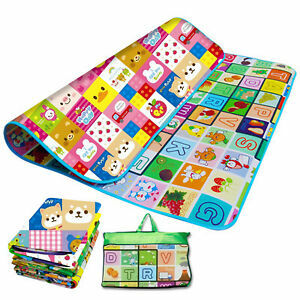 This educational baby crawling mat measures 180 cm by 200 cm. Made from soft foam, the mat is gentle on baby's delicate skin. The play mat is fully reversible, with colourful designs on both sides, and features colourful letters, numbers, and shapes to entertain and educate baby. Can be placed on any surface. The mat is lightweight and can be stored and transported easily.